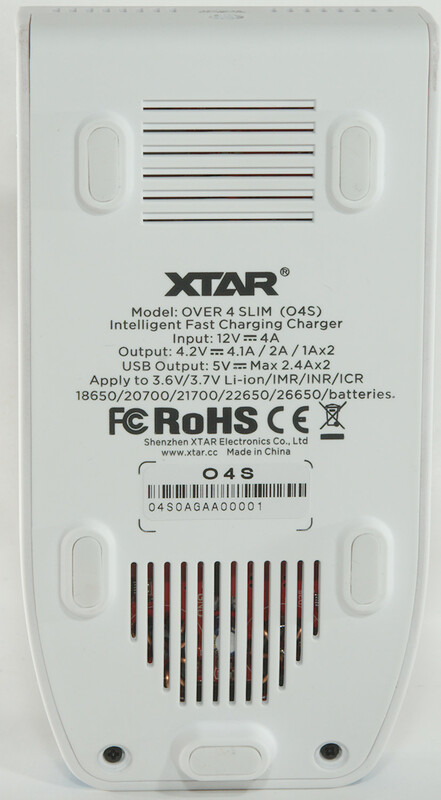 This is a high current charger from Xtar, the "Over 4" name is because it can charge with over 4A, it is only for LiIon batteries, especially high power batteries. In addition to charging batteries it is also a usb charger. I got the charger in a cardboard box with the specifications printed on it. Inside the box is the charger, a power supply, a mains cable and a manual. 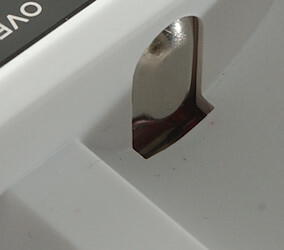 The user interface is two buttons, a display and for two red/green leds. 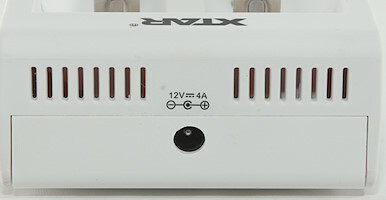 The buttons is used to select charge current, one for each channel. 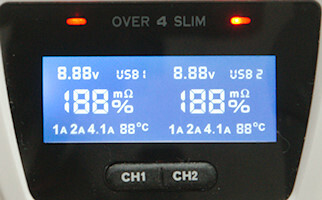 The two leds shows charge status, red while charging and green at all other times. 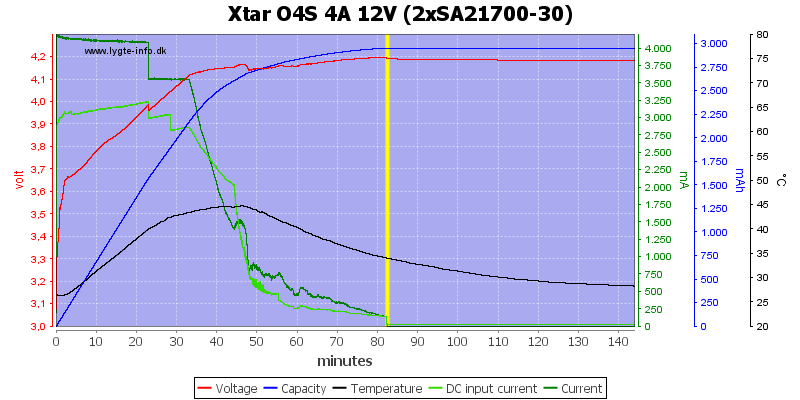 Charger is analyzing a battery and shows the internal resistance. It will not be shown during charger or when the charger is finished. During charge it will show a percent. The charge current is the requested current, not the actual current. 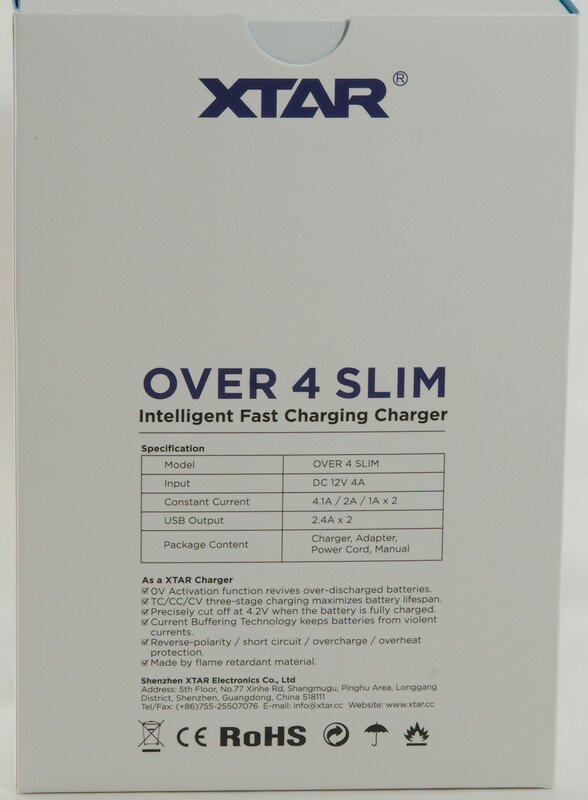 The charger has specifications on the back. 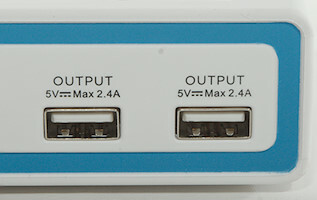 It has not one, but two usb charger outputs and both are rated for 2.4A. To handle the high charge current without batteries getting too warm the charger has a temperature sensor and to secure good contact it is pressed against the batteries with a spring. 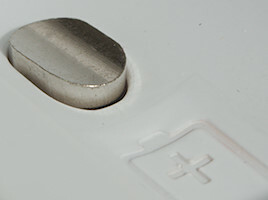 The charger can handle both button top and flat top batteries, but only long batteries, i.e. 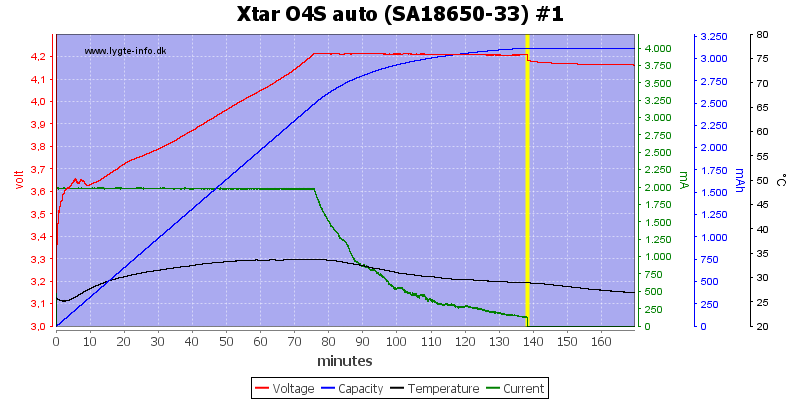 basically xx650 or xx700 types with or without protection. 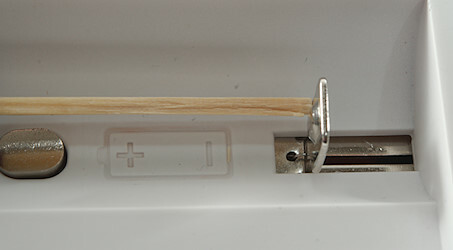 The slider moves smoothly and can hand cells from 60.3mm to 77 mm long. 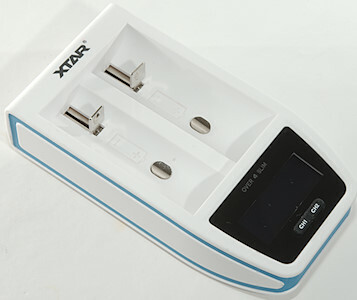 Charge current is 4.1A, 2A or 1A, depending on internal resistance in the battery charge will automatic select 4.1A or 2A. 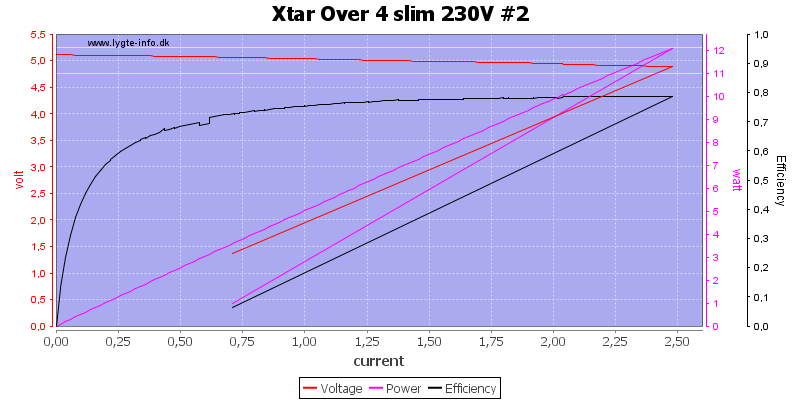 Power consumption when idle is 0.43 watt from mains. The charger will charge with 160mA from 0 volt, but always starts with a high current pulse. Below 2.5V the charger will report "Actv" for activating. Above 2.9 volt the full charge current will be applied. When charge is finished the charger will charge with 1mA. 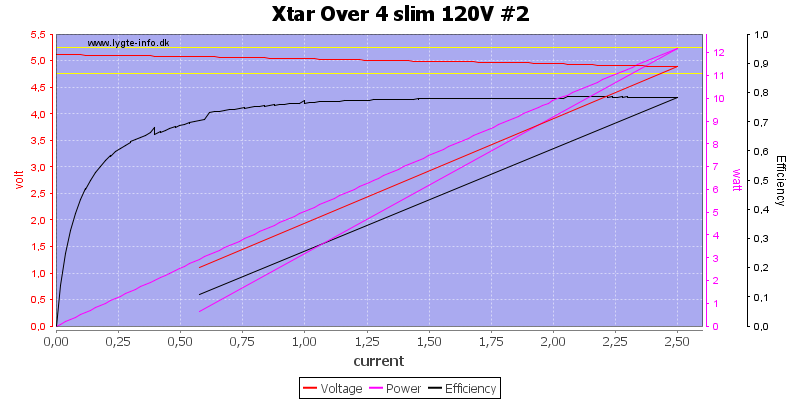 Voltmeter will update voltage, even after charging is done (Very good). 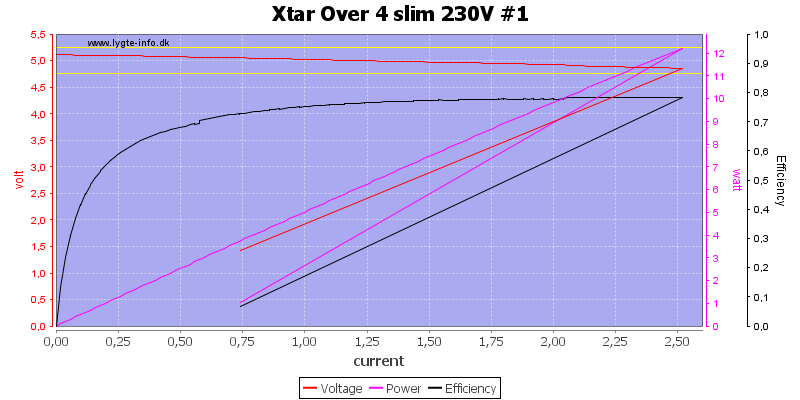 When not connected to power it will draw up to 6mA from a battery (This is a bit high). Display will reduce brightness after 60 second, but is still readable. 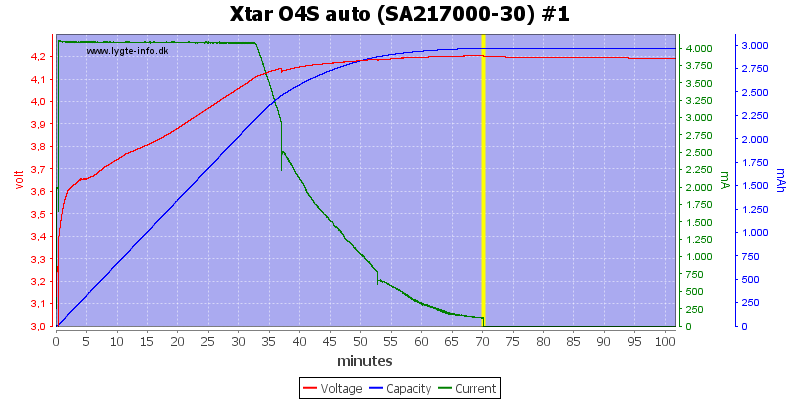 Charger will restart if voltage drops to 3.9 volt. 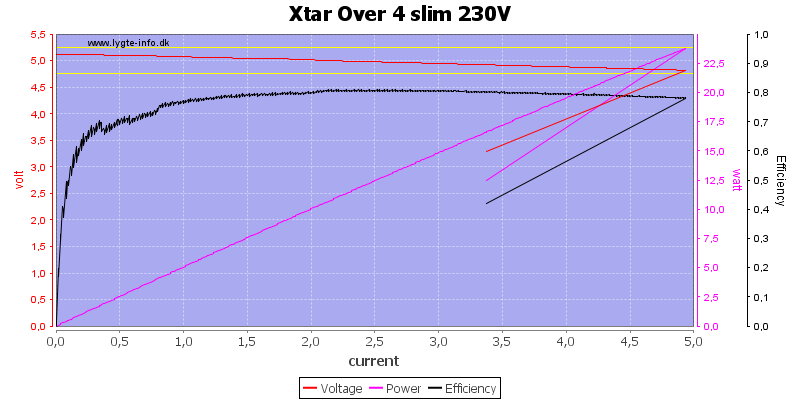 A nice CC/CV charge curve with about 130mA termination current. The second channel is about the same. No big surprise with these two batteries. 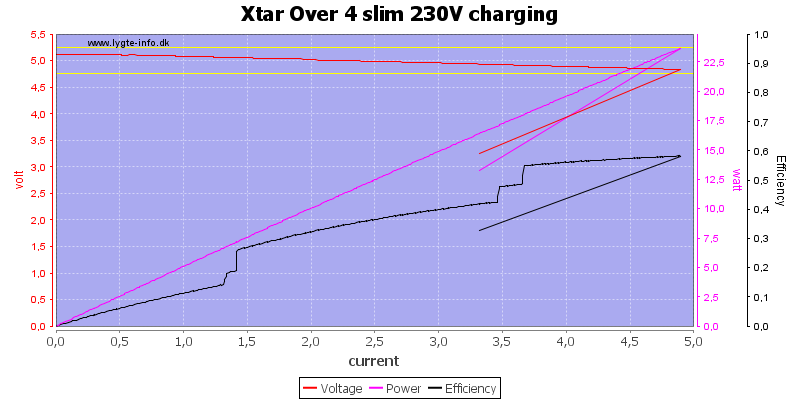 The -31 is a bit worn and the voltage drop at end of charge is a bit large. With automatic current selection the charger uses 2A, this is a bit high for this battery. It also starts out with 2A for this old cell, but it get reduced very fast, because the voltage goes up close to a fully charged battery. With this cell it works much better, the charger select 4.1A and the battery can handle it. With two 21700 cells at 4.1A the charger is at maximum power, it reduces the current a bit after about 27 minutes, I wonder if it is due to temperature. The charging looks fine. 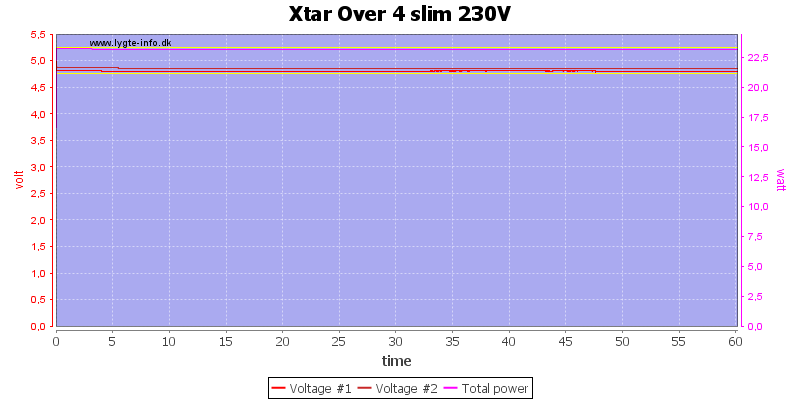 Using my 12V power supply I can see that the charger uses about 3.2A. 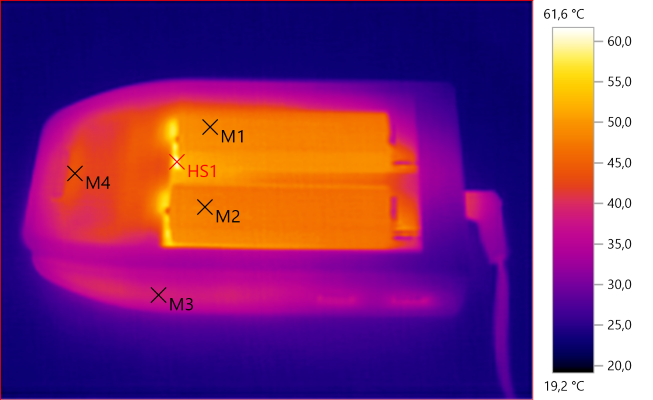 At 4.1A charging current even these larger batteries get warm, but if they get too hot the charger will reduce the current. 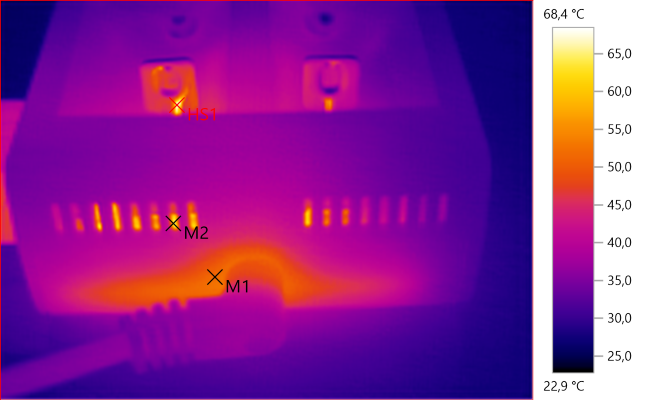 From power is applied the charger need about 1 second to initialize, then it start a internal impedance analysis and after that goes into charging. It is possible to charge current at any time during charging. 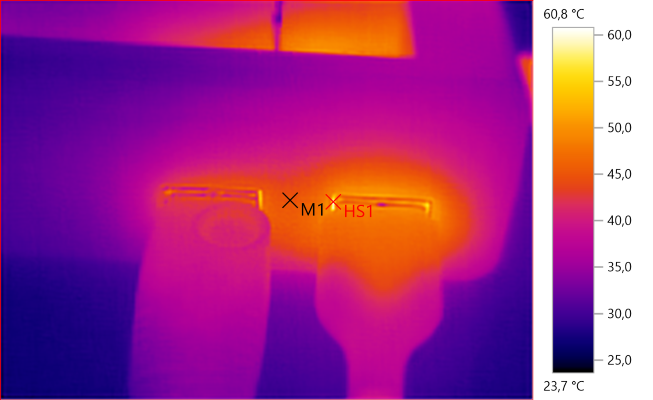 During my testing I saw some initial high current pulse and was I bit curious about it. I connected a NiMH battery (That looks roughly like a over discharged LiIon) together with a current clamp to record it. As can be seen I recorded a 5A pulse, but the spike at 0.0 is much higher, but very short (20uSec), this might be a capacitor that discharges. The full short spike cannot be seen because the curve is filtered. 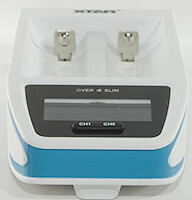 The charger bases the automatic selected charge current on the internal resistance. There is as always the problem with contact resistance as can be seen in the first row. When eliminating that the results are fairly consistent, but not completely correct, I only gets about 70% of the real resistance. I tried with higher resistances and the display would not show more than about 190, even with 1ohm in series with the battery. I checked the current selection, it was rather simple: Below about 45mOhm it used 4.1A, above it used 2A, it never dropped down to 1A. Usb ports are auto coding. Usb outputs are independent, but with a common + connection. The usb charger can deliver 2.5A, before overload protection kicks in. The second channel is the same. And 120VAC supply do not change anything. 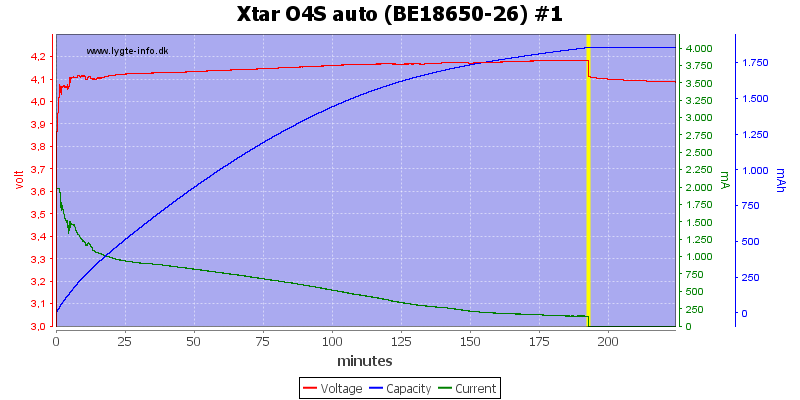 Even when the charger is charging batteries the usb output works, the steps on the efficiency curve is when the charger is reducing charge current to the batteries, to get more power for usb. 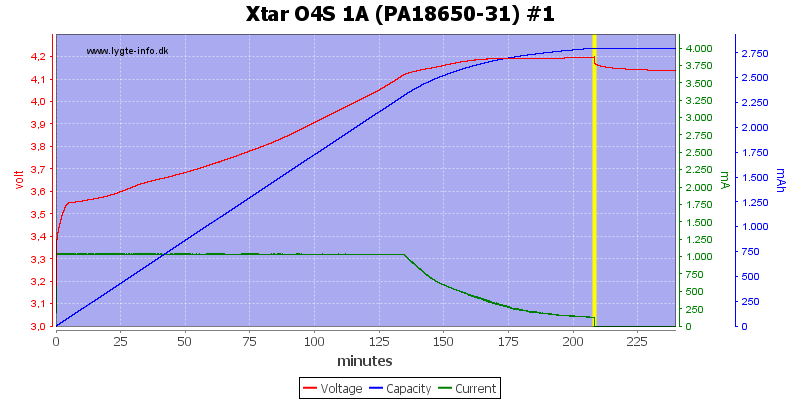 The charger has no problem running with full load for 1 hour. 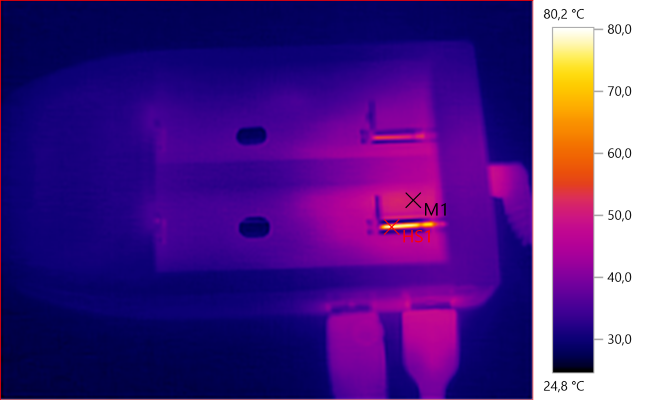 Some electronic inside the charger gets warm while handling full usb power. 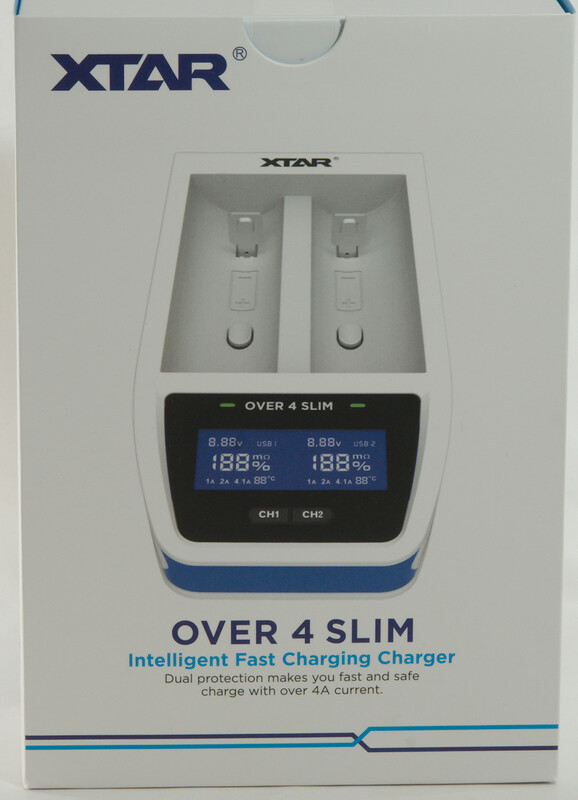 The charger is fast, but this is best used on batteries rated for high charge current. I am not impressed with the automatic current selection, it uses too high current for many batteries. 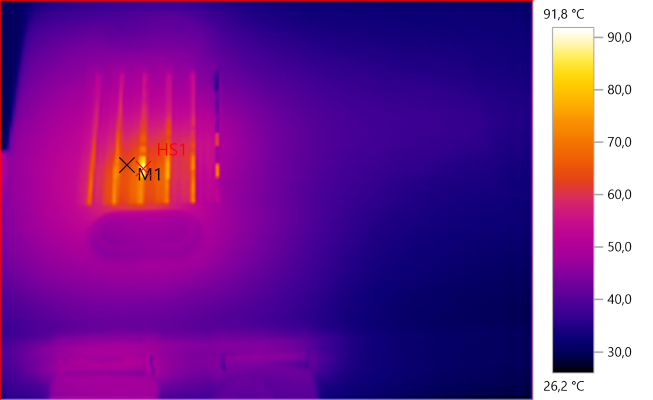 The temperature sensor will catch the worst cases and reduce current, but for long battery life it is better to always verify that the current is low enough, when not press the button to reduce it. The usb power supply is a good dual usb charger with enough current. I will rate the charger as good, but remember to turn the current down! 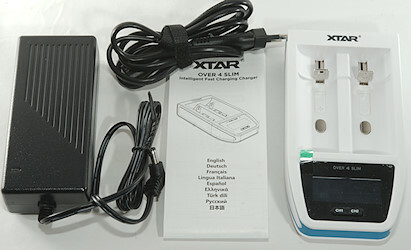 The charger was supplied by XTAR for a review.